New album: ”Polska till Vendelsjön”: Swedish traditional folk music has never sounded more exciting! The third album from expert folk musician duo Erika & Cecilia (Cecilia Österholm and Erika Lindgren Liljenstolpe) offers their trademark first-rate performance and musical emotion with rare telepathic interplay in tow. The strong melodic sounds of Cecilia’s nyckelharpa (keyed fiddle) – an instrument unique to the mid-region of Sweden – in combination with the close counterpoint of Erika’s swinging folk fiddle makes for a riveting, groovy and beautiful soundscape, allowing these folk music gems to sparkle (Do Music records). 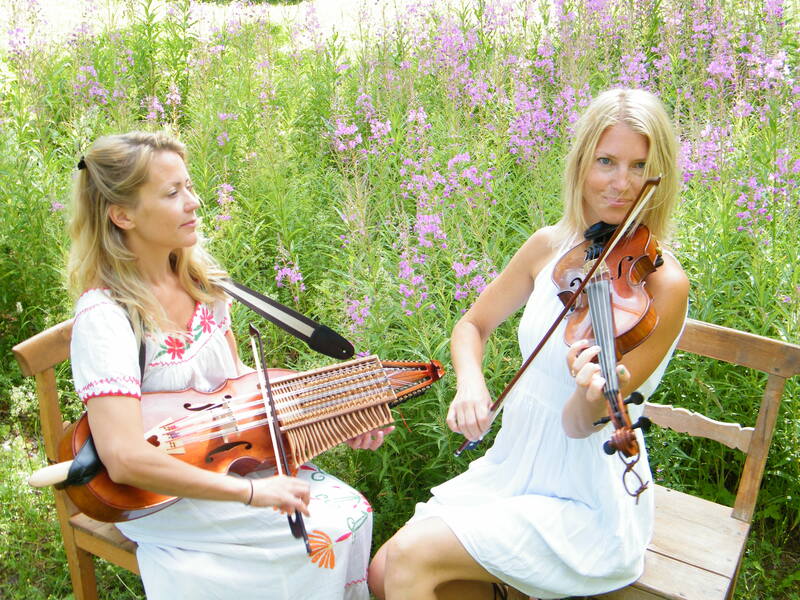 Erika Lindgren Liljenstolpe, fiddle, and Cecilia Österholm, nyckelharpa, became a duo in 2002. They have their roots in the folk music tradition of Uppland. Together, they have given concerts and toured frequently in Sweden and abroad, and have released three albums, “Pärlor” 2004, ”Örhängen” 2007 (www.tongang.se), and ”Polska till Vendelsjön” 2015 (Do Music records) which have all received very good reviews. They have played in various contexts: folk music festivals in Europé and USA, radio and TV performances, in more intimate settings such as in churches and clubs. The duo has also collaborated with musicians from other genres such as with Benny Andersson from Abba and opera singer Malena Ernman. Every now and then they give workshops in Swedish folk Music. Erika is a “Riksspelman” on violin, the most honourable title a Swedish fiddler can get. She has also received different marks of credits, such as the Viksta Lasse scholarship, the Päkkos-Gustaf’s mark of honour, as well as the gold medal of Upplands spelmansförbund. Cecilia was in 2012 priced for best folk album of the year with the group “Siri Karlsson”. She has also been teaching at Eric Sahlström Institutet, a national Swedish institute for folk music, and has given classes in music improvisation and folk music at the university of Uppsala. Villa san Michele, Capri 2012. The Polar Prize banquet, Stockholm 2010. Folk & Tanz im Rudolstadt, Germany (the biggest folk and world music festival in Europe) 2007. The American Folk Alliance conference, Memphis, USA 2007. Tour for Concerts Sweden 2007. Radio Music Hall concerts in Cologne for WDR3, 2005, 2006. The inauguration of the Anna Lindh Euro-Mediterranean Foundation for the dialogue between cultures, Bibliotheca Alexandrina, Egypt, 2005. Concerts in Cairo and Alexandria with the Italian band Novalia 2005. Tours in France and gigs at the festivals in Villarceaux and Soucourt 2003, and in Ris-Orangis 2005. ”Il posto delle fragole” in Rome 2002. TV and radio performances in Sweden, Germany, Spain and France. “Immergees dans un milieu de facon très proffessionelle, elles affiches pourtant spontanéité et complicité dans leur prestations, à deux doights de pouffrer de rire au moindre détour d’une de leur chansons. Il y a là du talent, de la simplicité, du charme. Si Oden est un type bien, il fera le nécessaire afin qu’elles conservent tout cela longtemps”.